President Barack Obama has visited the Demilitarized Zone (DMZ) separating South Korea from North Korea, amid rising tensions over the North’s planned rocket launch. Barack Obama went to an observation post on the volatile border, and met US troops. The president will hold talks in Seoul later. The US has voiced concern that the North Korea’s rocket launch due in April is a pretext for a missile test. Pyongyang says it wants to put a satellite into orbit. On Monday, Barack Obama will attend a security summit in Seoul. The conference in the South Korean capital will be attended by leaders from more than 50 nations. The summit main focus will be preventing criminal or militant groups from acquiring nuclear weapons. Pyongyang’s nuclear programme is not officially on the agenda. But American officials have made it clear that President Barack Obama will be discussing the programmes of both North Korea and Iran in bilateral meetings with the Chinese and Russian presidents, our correspondent says. North Korea is not taking part in the summit. 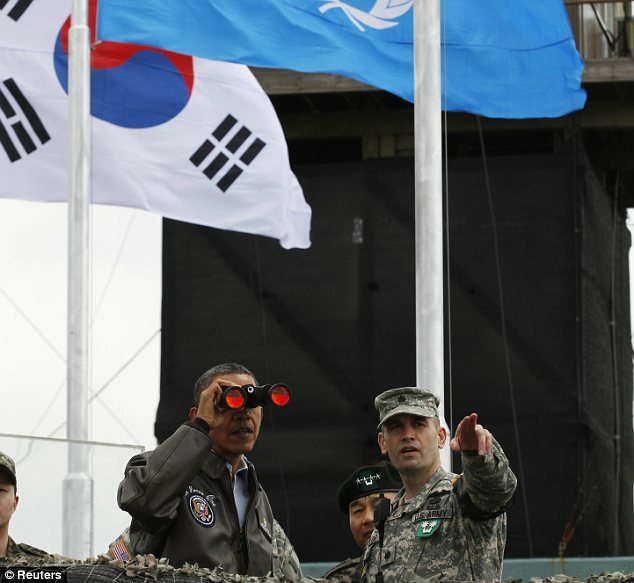 It was Barack Obama’s first visit to the DMZ, which has bisected the peninsula since the end of the Korean War in 1953. The president told US troops serving there that they were protecting “freedom’s frontier”. Earlier this week, Japan said it was readying its anti-missile defenses ahead of North Korea’s launch, expected between 12 and 16 April. Pyongyang says the rocket – which would mark the 100th birthday of its late Great Leader Kim Il-Sung – would take a new southern trajectory instead of a previous route east over Japan. US Assistant Secretary of State Kurt Campbell has said an area between Australia, Indonesia and the Philippines could be affected by the flight path. North Korea has shown a growing mastery of ballistic technology during its three previous long-range tests. However, experts say none has succeeded in reaching orbit, and debris has fallen to earth at various stages during the launches. Last month North Korea offered a deal involving the freezing of its nuclear and long-rang missile programmes in return for US food aid.